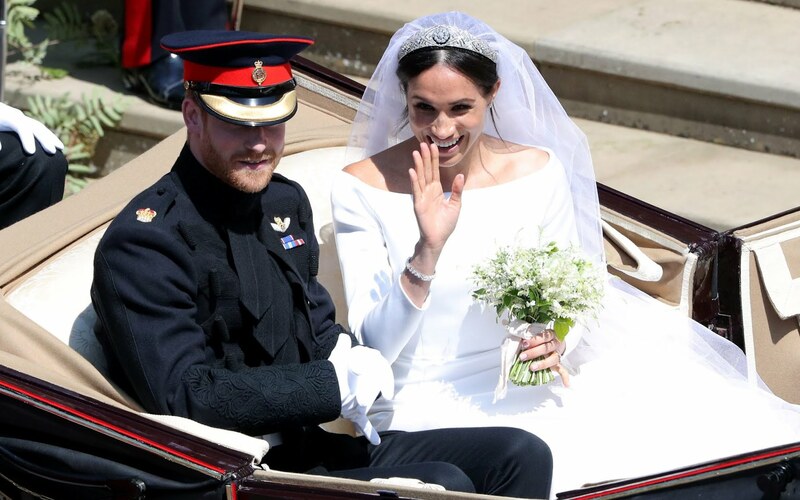 After the couple - the new Duke and Duchess of Sussex - tied the knot at St George's Chapel, they are now delighting tens of thousands of well-wishers as they travel through Windsor in an open-topped carriage. 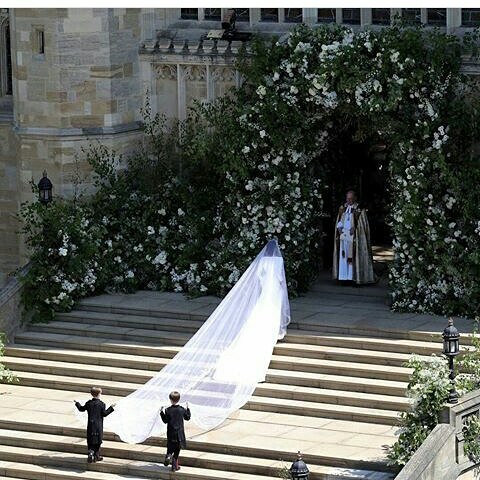 Ms Markle's white wedding dress - with a white veil and boat neck - was created by British designer Clare Waight Keller, the first female Artistic Director at French fashion house Givenchy. Prince Harry and his best man the Duke of Cambridge are both wearing the frockcoat uniform of the Blues and Royals. A host of celebrities including Oprah Winfrey, George Clooney and David Beckham are among the 600 invited guests alongside senior members of the Royal family. 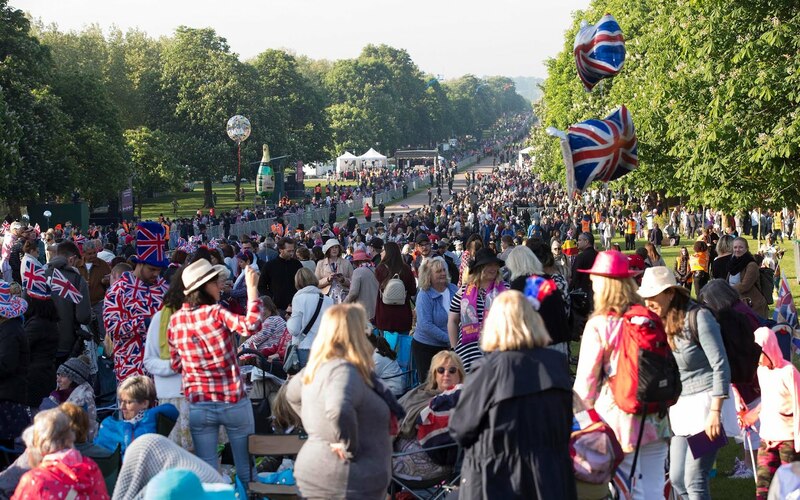 Another 2,640 members of the public have been chosen to watch the ceremony from the grounds of Windsor Castle. After arriving with her mother, Doria Ragland, Ms Markle walked up the Nave of St George's Chapel - the first part of the church - on her own in front of a global television audience of millions. She was followed by her six bridesmaids and four pageboys including Prince George and Princess Charlotte. Ms Markle was then accompanied by Charles through the Quire, which begins in the middle of the chapel. The couple were declared husband and wife at shortly before 12.45pm, but the ceremony omitted the traditional moment of "giving away". 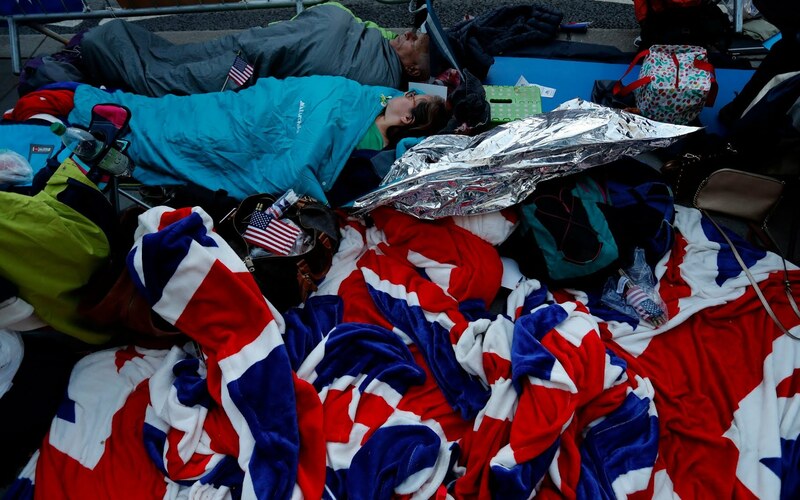 Huge crowds have gathered in Windsor, with hundreds of die-hard royalists - many decked out in the national colours of both Britain and the United States - camping out overnight to secure the best views. Prince Harry and Ms Markle are being met with a wall of cheering and flag-waving as the procession makes its way through the streets of Windsor. The pair smiled and waved to well-wishers during the journey in the lunchtime sunshine. They are heading to St George's Hall for a lunchtime reception hosted by the Queen. The Prince and Ms Markle thrilled fans as they left Windsor Castle in a horse-drawn carriage. They cheered and screamed as the newlyweds passed by. Rachael Carter-Eagleton said: "She looked amazing. She shone like a diamond." 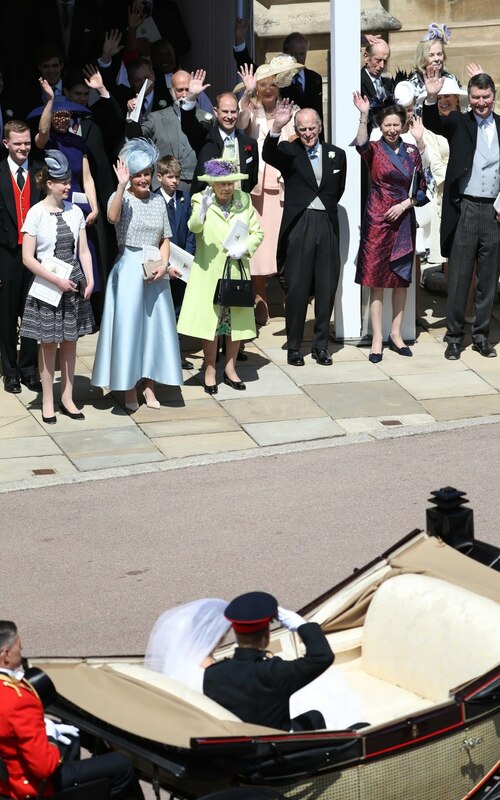 After the newlyweds emerged at the West Steps of the Chapel, the couple were waved off and watched by members of the Royal family as they left in an open-top Ascot Landau for a carriage procession through Windsor. Next, the congregation will head to St George's Hall for a lunchtime reception hosted by the Queen. The newlyweds emerged from St George's Chapel to loud cheers from the crowd. Stopping at the top of the stone steps, the pair shared a kiss to the delight of onlookers. 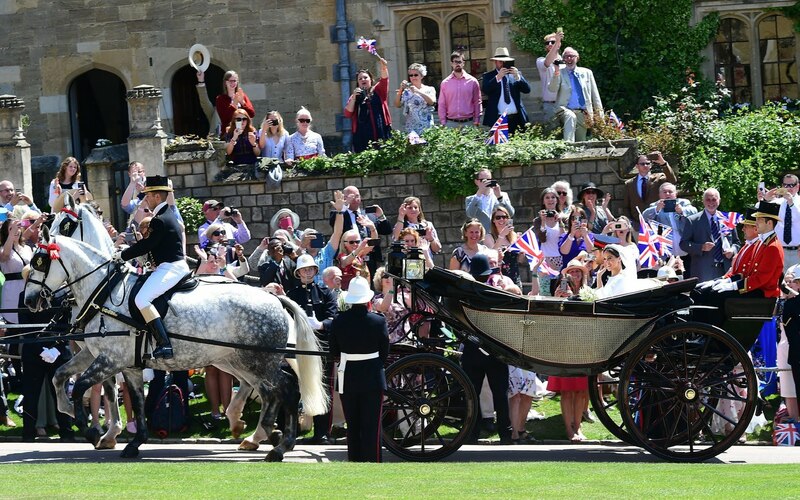 Just as Harry and Meghan were officially married, the horse-drawn carriage in which they will depart from St George's Chapel was brought into Horseshoe Cloister. The organ is now playing as those who are signing the registers move from the Quire to the North Quire Aisle. During the signing of the register, the following is played by Sheku Kanneh-Mason, a young cellist, plus the orchestra. He hails from Nottingham and comes from an astonishingly gifted family. He won BBC Young Musician of the Year in 2016. Von Paradis was a notable 18th century Viennese pianist and composer. Mozart probably wrote his Piano Concerto no 18 for her. She became blind at an early age but that didn’t stop her musical career. This piece probably isn’t by her – it was probably by the 20 th century violinist Samuel Dushkin. This song has been endlessly re-arranged. It’s the single most popular song by this late 19th – early 20th century composer. It sounds like a piece of Latin church music, but in fact it’s one a set of songs Schubert composed in 1825, all based on poems in Sir Walter Scott’s epic ‘The Lady of the Lake’. This one is based on a prayer uttered by Ellen in front of the Virgin Mary, asking for forgiveness for her father’s sins. View of Telegraph's classical music critic Ivan Hewett: Notable not only for striking a Welsh note (appropriate for the wedding of the son of the Prince of Wales) but for its family resonances. It was sung at both Kate and William's wedding and Diana's funeral and so its inclusion may well be among the ceremony’s most poignant notes. Prayers are now being led by Archbishop Angaelos and The Reverend Prebendary Rose Hudson-Wilkin from the Nave. 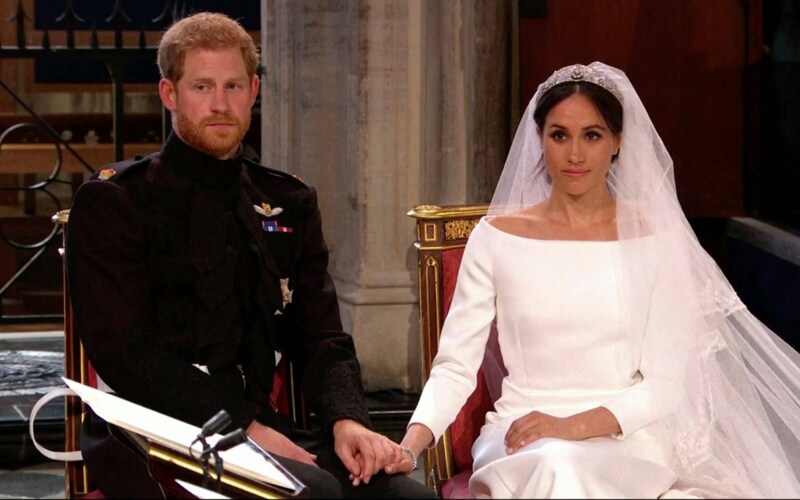 The Archbishop says: "In the presence of God, and before this congregation, Harry and Meghan have given their consent and made their marriage vows to each other. They have declared their marriage by the joining of hands and by the giving and receiving of rings. I therefore proclaim that they are husband and wife." The Archbishop joins their right hands together and says: "Those whom God has joined together let no-one put asunder." The couple are now officially married! The Duke of Cambridge, in his role as best man, stepped forward to hand over the rings. Prince Harry now places the wedding ring on the fourth finger of Ms Markle's left hand and, holding it there, says: "I give you this ring as a sign of our marriage. With my body I honour you, all that I am I give to you, and all that I have I share with you, within the love of God, Father, Son and Holy Spirit." Ms Markle now does the same before the Archbishop of Canterbury addresses the congregation. Now the Archbishop of Canterbury, is leading the vows. "I Harry, take you, Meghan, to be my wife, to have and to hold from, this day forward; for better, for worse, for richer, for poorer, in sickness and in health, to love and to cherish, till death us do part; according to God's holy law. In the presence of God I make this vow." "I Meghan, take you, Harry, to be my husband, to have and to hold , from this day forward; for better, for worse, for richer, for poorer, in sickness and in health, to love and to cherish, till death us do part; according to God's holy law. In the presence of God I make this vow." After that effusive sermon, next up Karen Gibson and The Kingdom Choir are singing Stand By Me, Ben E King’s 1960 pop song. It’s not a sacred piece, but the words have the just the right sentiment. It’s all about standing by your loved one in testing times, and it was inspired by the spiritual “Stand by me Father” – which itself refers to Psalm 46. The Performers are Kingdom Choir – 20 singers based in South-East London directed by Karen Gibson. The website says “They are a unique group of dedicated men and women, who blend Choral discipline with the raw Gospel spiritual sound – drawn from an inner experience. 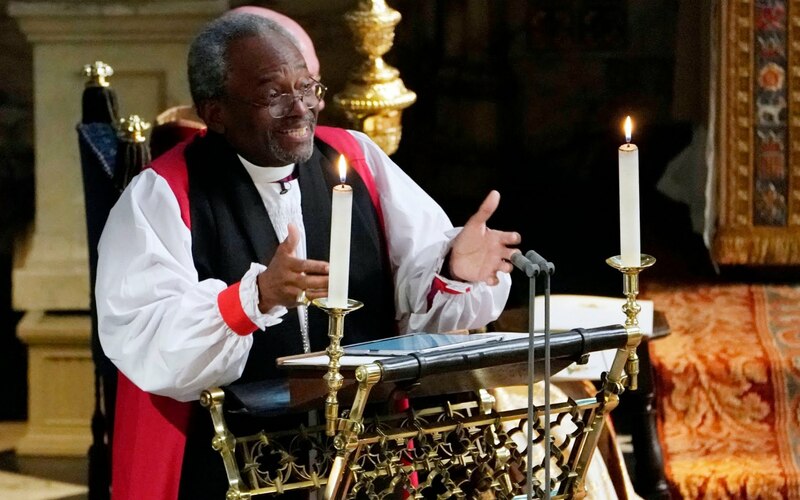 The Most Rev Bishop Michael Curry, the first African-American presiding bishop and primate of the Episcopal Church, gave an address titled the Power of Love at the service in St George's Chapel. He opened his speech with the words of Civil Rights leader Martin Luther King Jr, who said: "We must discover the power of love, the redemptive power of love. And when we do that, we will be able to make of this old world a new world. Love is the only way." Bishop Curry told the service: "There's power in love. Love can help and heal when nothing else can. There's power in love to lift up and liberate when nothing else will." Such power could be seen in the service, he continued, saying: "Two young people fell in love and we all showed up." The Episcopal Church is the US offshoot of the Church of England and forms part of the broader Anglican Communion. Meghan was baptised into the Anglican Church, which is headed by Harry's grandmother. All remain seated while the choir of St George's Chapel sing If Ye Love Me, by Thomas Tallis. Beautifully simple – which it had to be, because Tallis’s ultimate boss – Archbishop Cranmer, one of the architects of the English Reformation – said the old Latin church music had got too complicated and the words could no longer be heard, and composers now had to write simpler, audible pieces in English – without being plain and dull. Tallis pulls it off brilliantly. Next is a reading from the Song of Solomon read by The Lady Jane Fellowes (Princess Diana's sister) from the Nave. Here, Tristram Saunders examines the significance of the reading. 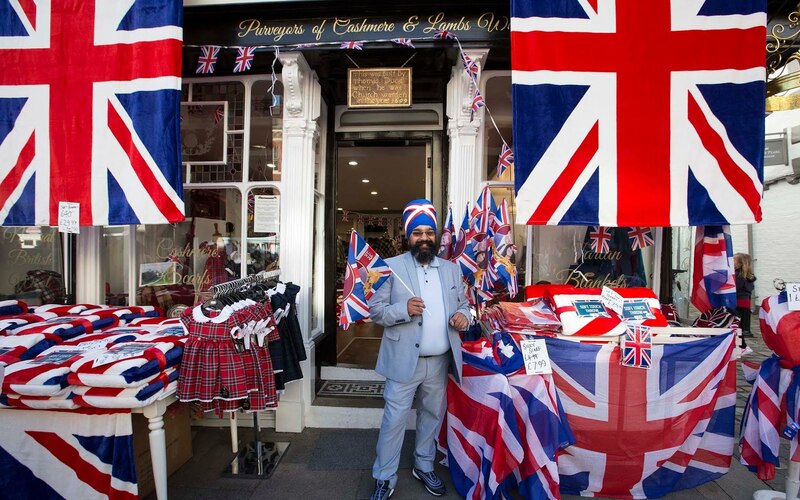 The ceremony is being played through loudspeakers hanging on the side of Windsor Castle, so the crowds gathered on the streets outside can hear but not see proceedings. Prince Harry and Meghan Markle are holding hands as the wedding ceremony begins. At the High Altar, the Archbishop of Canterbury, Justin Welby, is now beginning the declarations. 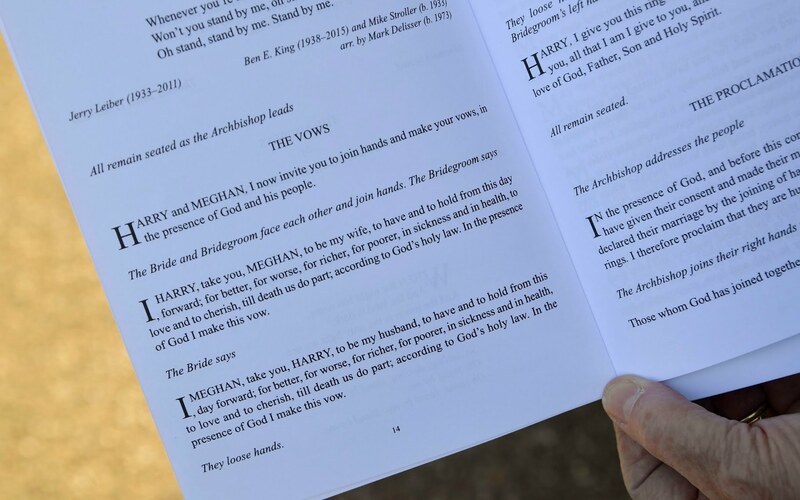 The Archbishop says to the bridegroom: "Harry, will you take Meghan to be your wife? Will you love her, comfort her, honour and protect her, and, forsaking all others, be faithful to her as long as you both shall live?" There is laughter in the chapel as Prince Harry answers: "I will." The Archbishop then asks Ms Markle the same, and she responds: "I will." 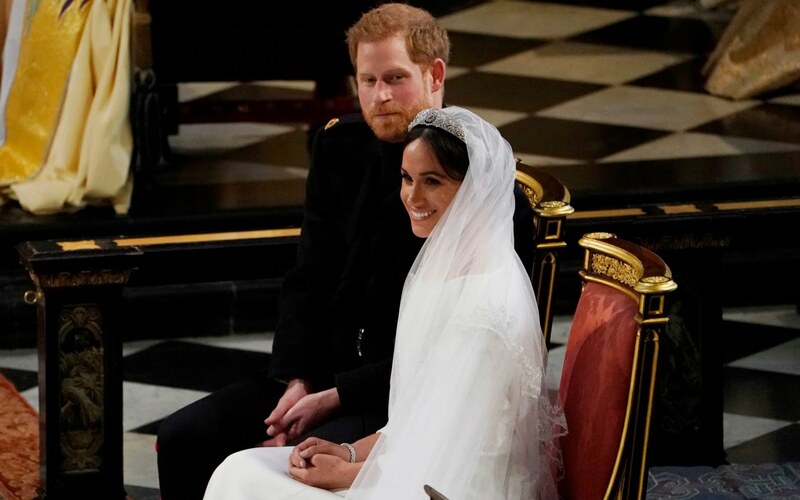 As Ms Markle approached the altar, Prince Harry mouthed the words: "You look amazing." She arrived accompanied by two page boys who held up her train as she made her way up the chapel's steps alone. As Ms Markle entered the chapel, a fanfare was played. 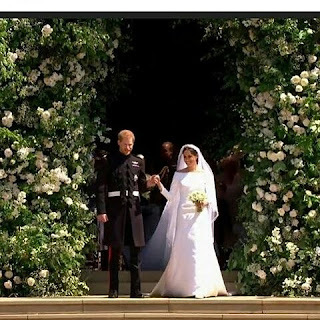 The bride, having been greeted by the Dean of Windsor, then moved in procession through the Nave where she was joined by the Prince of Wales - in place of her father, Thomas Markle, to the High Altar. The bridegroom and his best man await. Here comes the bride! Meghan Markle has arrived at the Chapel's West Steps by car. She will now walk through the Nave on her own followed by her bridesmaids and pageboys, who include Princess Charlotte and Prince George, before being accompanied by Charles down the aisle of the Quire. Her dress is by Clare Waight Keller for Givenchy. As she arrived at Windsor Castle, she was followed by three cars carrying page boys, bridesmaids and their mothers: the Duchess of Cambridge, Jessica Mulroney and Benita Litt. As Ms Markle arrived at the West Steps, she was accompanied by Brian and John Mulroney, the seven-year-old twin page boys. The Queen has arrived at St George's Chapel with the Duke of Edinburgh - and the monarch is wearing a lime-green dress by Stewart Parvin. Following protocol, the Queen is the last member of the Royal family to arrive for the wedding service. Those in the Quire stand as Her Majesty is conducted to her place in the Quire. A fanfare sounds and all stand as the choir and clergy move in procession to the Quire. Prince Charles, who will walk Ms Markle down the aisle, has arrived with his wife, Camilla, Duchess of Cornwall. Meanwhile, Prince Harry has taken his place in St George's Chapel, sitting with his brother the Duke of Cambridge. The pair sat on chairs at the top of the altar. At one point, Harry turned to talk to guests, and let out a sigh as he waited for his royal bride to arrive. Ms Markle's mother Doria Ragland arrives at the Galilee Porch and is received by the Dean of Windsor. Huge crowds lined the Long Walk to Windsor Castle as the Rolls-Royce made its way escorted by three Range Rovers. Well-wishers cheered and waved flags as the car passed, before making its way through the gates on its way to the chapel. With just 15 minutes until the bride arrives, here's what music is being played inside St George's Chapel. A folky/antique theme dominates in this sequence of pieces. Elgar’s first published piece. Originally written in 1888 as a gift for his future wife Carice. He sold the rights to the publisher for two guineas, which was a really bad move. 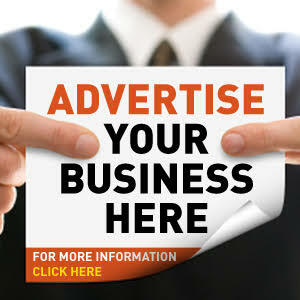 It became massively popular and could have earned him a fortune. Parry, a leading light of the so-called ‘English Renaissance’ who was the first director of the Royal College of Music in 1883. He wrote his Lady Radnor’s suite in 1894 for the all-women orchestra conducted by Helen, Countess of Radnor. It’s a kind of Baroque Suite in Victorian dress. Set of dances based on a book of Renaissance dances composed by Peter Warlock (gifted composer who died in 1930 aged 36). Vaughan Williams was a collector of folk-song, and wrote many pieces based on the songs he found. This one is especially beloved, it’s always in Classic FM’s Hall of Fame. More famous and well-known than the tune it’s based on. Elgar’s first really successful work, completed in 1893. It remained one of his favourite works right to the end of his life. He liked it because it was ‘really stringy’ – weird phrase but a musician knows What he means – it completely suits a string orchestra, you couldn’t arrange it for something else. In his early days, Elgar was always complaining about having no money, and wrote this delicious piece in 1899 as a deliberate money-spinner for his publisher Novello. It worked. Harry looked relaxed as he walked down to the chapel with his brother, the Duke of Cambridge, to loud cheers from the waiting crowd. Cheers and applause erupted at the West Door as the pair arrived. The bridegroom and his best man were met by the Dean of Windsor. They stopped for a few moments and had a brief conversation, before walking inside. Harry, looking dapper in his frockcoat uniform of the Blues and Royals, walked up the aisle with his best man and was seen acknowledging a guest in the congregation with a nod. Prince Harry and his best man the Duke of Cambridge have arrived at St George's Chapel, in Windsor Castle, for his wedding to Meghan Markle. Both Harry and the Duke of Cambridge are wearing the frockcoat uniform of the Blues and Royals. The Queen gave her permission for her grandson to get married in his uniform, Kensington Palace said. Meghan Markle has left the Cliveden House Hotel in a vintage Rolls-Royce limousine to travel to Windsor Castle for her wedding to Prince Harry. Ms Markle sat in the rear of the Phantom IV car with mother, Doria Ragland. Wearing a white veil and white dress with a boat neck, she waved to onlookers as the car departed at 11.19am. Members of the Royal family have begun to arrive and enter via the Galilee Porch, some on foot and others by car. They included the Duke and Duchess of Kent; Princess Anne, the Princess Royal and Mike and Zara Tindall. Sarah Ferguson was also pictured arriving. The Duke of York and the Earl of Wessex have also taken their seats inside the Quire of St George's Chapel. Tennis champion Serena Williams has arrived with her husband Alexis Ohanian, co-founder of Reddit, at St George's Chapel. Meanwhile, among those providing the wedding with an injection of Hollywood glamour are the cast of Suits, writes Ed Power. The stars of the legal drama in which Markle achieved fame as plucky litigator Rachel Zane have been arriving in the UK all week and celebrated a “last supper” in their former colleague’s honour at a restaurant near Windsor Friday night. Patrick J Adams, who plays Markle's onscreen love interest (and lately husband) Mike Ross, is attending the knot-tying today, along with co-stars Gabriel Macht, Sarah Rafferty, Rick Hoffman, Abigail Spencer, Gina Torres and Amanda Schull. Sir Elton John, who has arrived for the ceremony with husband David Furnish, was seen warmly embracing David and Victoria Beckham, as well as singer James Blunt. Throughout the morning, hundreds of members of the public gathered on the grass alongside St George’s Chapel, reports Victoria Ward. Dressed in their finery, they laid out picnic rugs and folding chairs and settled down to watch the only show in town. From their ringside seats, the crowds, some 1,200 of whom had been invited in recognition of the work they have done for their communities, watched the steady stream of guests arrive at the chapel. Penned in behind rope but just a stone’s throw away, they grew increasingly animated as people began to arrive, walking right past them, the length of the chapel from the Round Tower to the Galilee Porch. Many waved flags and cheered as familiar faces walked by, including Idris Elba and Oprah Winfrey. “Oh there goes James Blunt, and James Blunt wants everyone to make sure they’ve seen James Blunt,” laughed one, as the singer paused to wave to the spectators. To the sound of champagne corks popping and cameras clicking, the crowd, basking in the sun, provided a jovial running commentary on the guests’ outfits. Many stood to watch the steady procession while others simply sat and soaked up the atmosphere, reading newspapers and sipping prosecco. 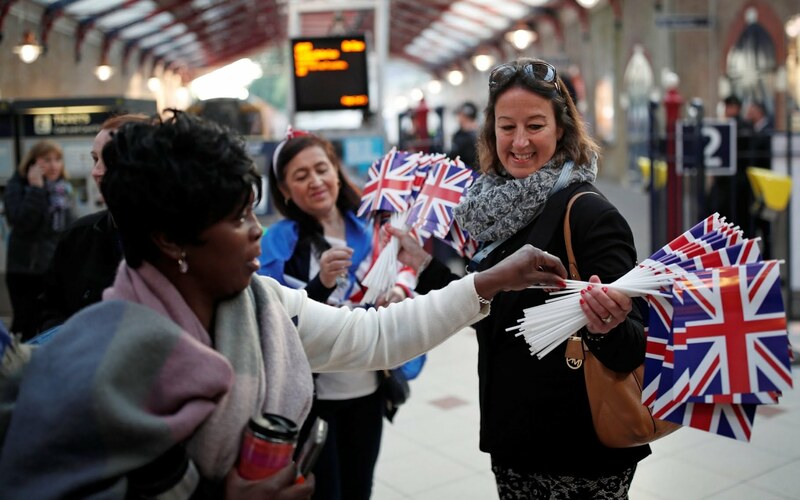 A few dipped into their “goody bags” - canvas bags inscribed with Harry and Meghan’s initials and packed with branded chocolate, shortbread, a magnet, a bottle of Windsor Castle water and a wedding programme, not to mention a voucher for 20 per cent off in the castle shop. On occasion, the crowd fell silent as they studiously watched the procession, trying to identify well-known faces and admiring the colourful parade. “Try and get to know your neighbours really well,” a member of staff yelled at them. “Make friends, sit tight, enjoy yourselves." Actor Tom Hardy and former rugby union player Jonny Wilkinson are among the other guests to arrive at St George's Chapel. Others include musician Marcus Mumford, actress Carey Mulligan and singer Joss Stone. Actor George Clooney and his barrister wife Amal have arrived at St George's Chapel, followed closely by David and Victoria Beckham. The Duchess of Cambridge's family, including her parents Michael and Carole, brother James and sister Pippa, have arrived at St George's Chapel for the royal wedding. Pippa is wearing a Hepburn dress by British brand The Fold - made of pure Italian silk, it is patterned with a delicate floral print inspired by chinoiserie. Prince Harry's former girlfriend Chelsy Davy has arrived at St George's Chapel. Prince Harry's mentor, former Welsh Guards officer Mark Dyer, has also arrived ready to take his seat. Prince Harry's wedding ring will be a platinum band with a textured finish and Meghan Markle's ring has been fashioned from a piece of Welsh gold, Kensington Palace announced. The rings will be made by Cleave and Company. 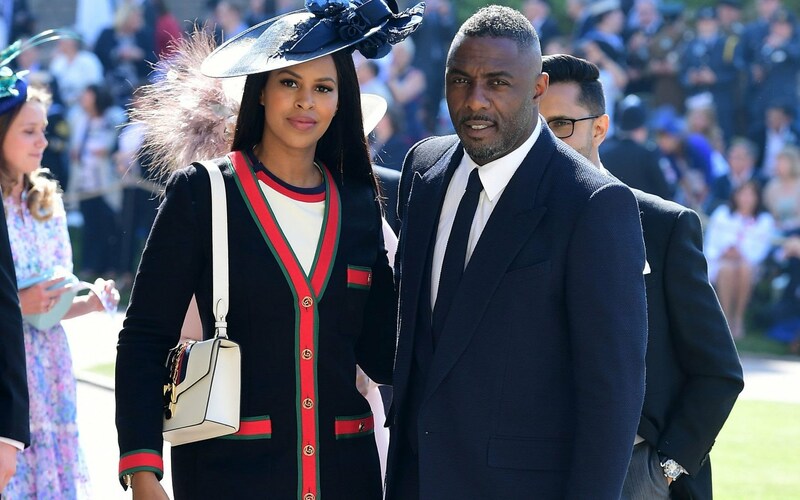 Guests including Oprah Winfrey, actor Idris Elba and Earl Spencer, the brother of Diana, Princess of Wales, are among the guests who have arrived at St George's Chapel. According to a list of the hats designed by milliner Philip Treacy, Winfrey is wearing a natural sweeping brimmed hat with artisan sculpted flower. A host of other celebrities are expected to attend the star-studded ceremony. Click here for more today's guest list. After royal wedding... it's the FA Cup final! Royal wedding fever is mounting, but it is not the only big event of the day - it is also FA Cup final day. Prince William, president of the Football Association, is missing the FA Cup final in favour of the wedding celebrations. Click here to find everything you need to know about the FA Cup finalbetween Manchester United and Chelsea. As the morning chill gave way to sunshine, the mood in the Windsor crowd grew ever more festive, reports Judith Woods. Free cardboard crowns and commemorative brochures were handed out and a sea of red white and blue stretched the two-and-a-half mile length of the town’s tree-lined Long Walk. Food stalls delivered breakfast baps to wellwishers on blankets and the pop of every prosecco cork was met with a cheer. 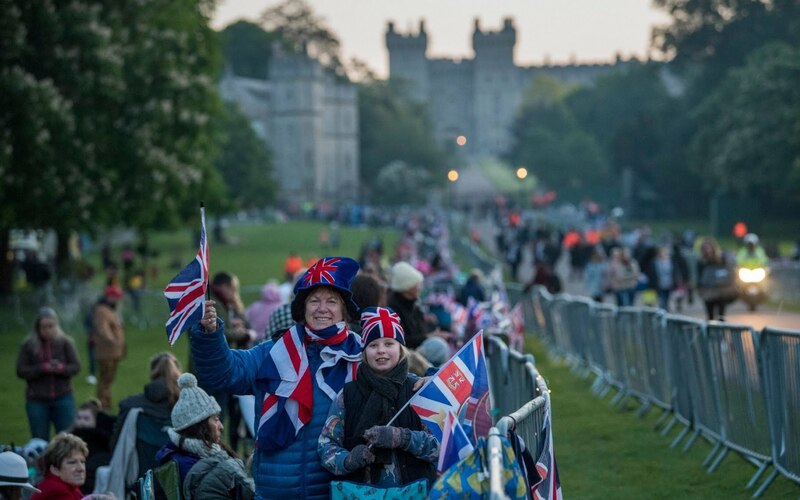 Castle Hill and Windsor High Street are packed with excited well wishers already, many of whom have camped overnight, or arrived at the crack of dawn to get a spot, reports Eleanor Steafel in Windsor. Jules Arrowsmith, 58, has been in Windsor since 4am. Mrs Arrowsmith, from Cheshire, said this was the first royal wedding she has come out to watch. Daniel Zhang, who is turning 21 today, has travelled all the way from China to be here today. Laury Lesueurs, 21, from Auvergne, France, said she had always loved the royal family and didn’t want to miss out on the chance to see Meghan and Harry go past in their carriage. “Since I was little I’ve been obsessed with the royal family and England. John Budge, 67, has been invited to come and watch the wedding from inside the castle for his long service to the RNLI in Orkney. Mr Budge, who now works as the operations manager at Longhope lifeboat station, brought his daughter Helen with him. 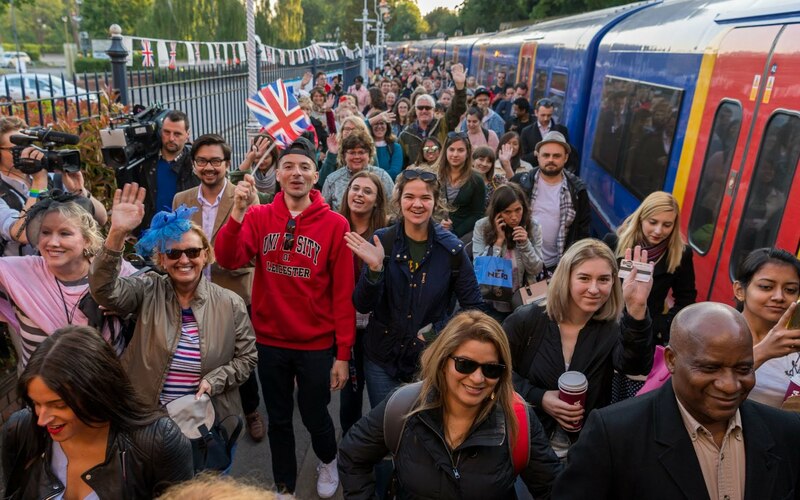 There was something distinctly unusual about the 05.18 train from Paddington this morning, reports Judith Woods. The fancy frocks, the Union flags, and the air of excited merriment set the service to Windsor & Eton Central apart. 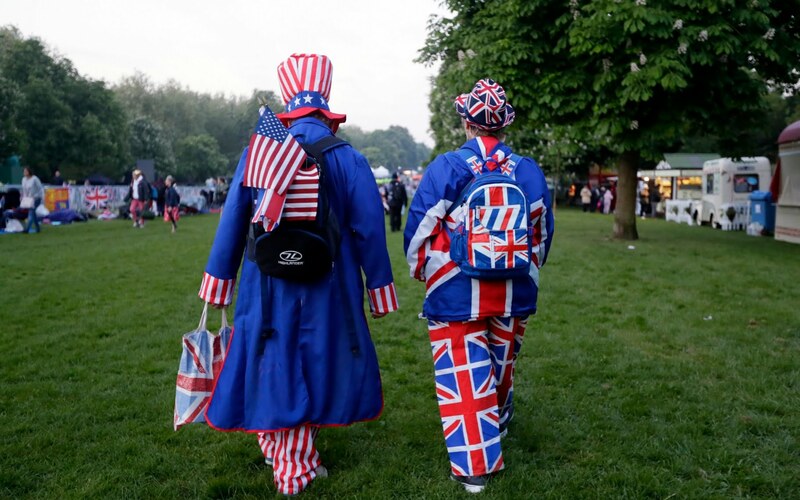 Strangers not only made eye contact, they chatted animatedly, someone whistled a wedding march and there was talk of nothing but Harry and Meghan’s nuptials. “I’ve been up since midnight,” said Laurie Walls, 33, a bookseller and librarian from Indiana, who took two weeks off work to travel to Britain for the wedding. Imperial College student Max Botheras, 24, described his trek to Windsor as “participating in history”. Meghan, he felt, was a wonderful addition to the royal family. For Canadian Charmaine Goodman, 51, from Ottowa, resplendent in smart red day dress and extravagant fascinator, there was no question of missing Harry and Meghan’s big day. Her friend, a teacher from Jamaica, declined to speak as she was pulling a sickie. But who could blame her? “Today will be the most amazing party on the planet,” asserted Fiona Coulter, 40, from Nottinghamshire, a rolled up Union Jack in her hand. Prince Harry has been made the Duke of Sussex on his wedding day by his grandmother the Queen, Buckingham Palace has announced. Meghan Markle will become the Duchess of Sussex on marriage, the palace said. 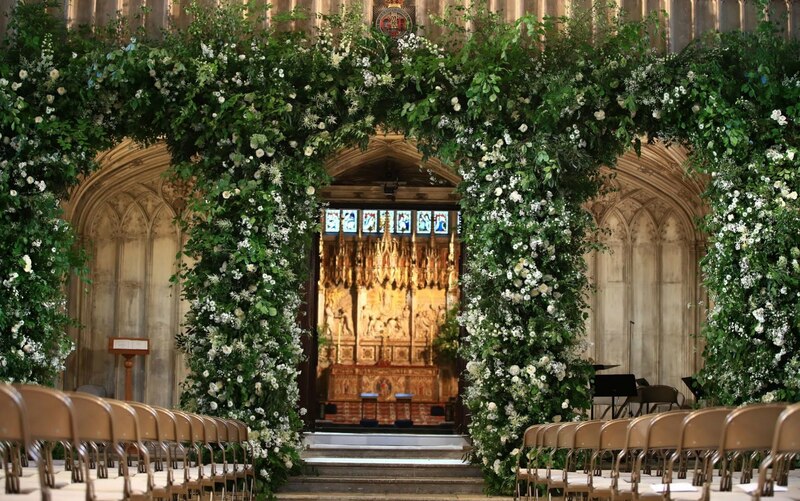 St George's Chapel has been adorned with floral displays ahead of Prince Harry and Meghan Markle tying the knot. A central arch will serve to frame the royal couple as a congregation of family, friends and well-wishers watch them take their vows. When Meghan Markle enters St George’s Chapel to begin the last steps in her journey to join the Royal family, the state trumpeters will sound a fanfare that has accompanied its brides for generations, reports The Telegraph's Royal Correspondent Hannah Furness. 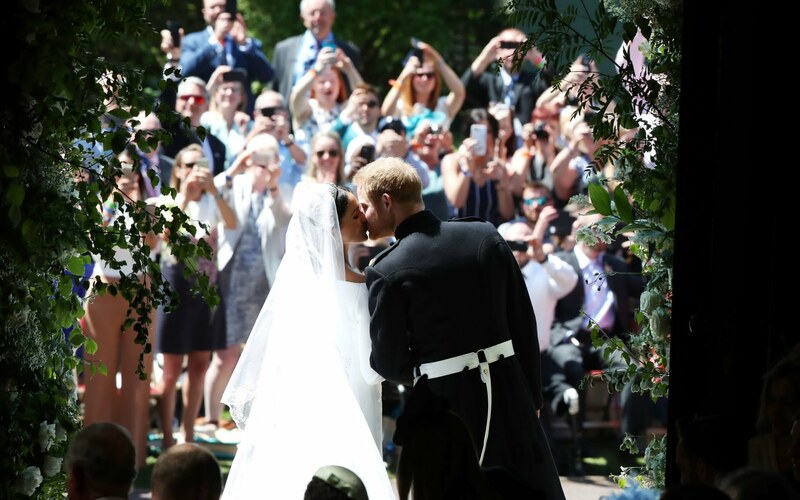 Before long, as she says her vows to Prince Harry, that time-honoured tradition will give way to striking modernity, with the soaring voices of a gospel choir singing music from Ben E King and Etta James. Saturday's Royal wedding ceremony, with each detail chosen by the couple, will blend the best-loved elements of British pageantry with a modern outlook that reflects the Prince and Ms Markle, in a service designed to capture the best of each of their heritage. From the music of Sir Charles Hubert Parry and a reading from the Bible to a procession of a newlyweds accompanied by a rendition of This Little Light of Mine, their choices go to the heart of their relationship: English customs blended with an American influence, offset by an overriding message of joy. Most of the ceremony will see the Prince and Ms Markle referred to simply as “Harry and Meghan”, eschewing the full repetition of their names: Prince Henry Charles Albert David and Rachel Meghan Markle. 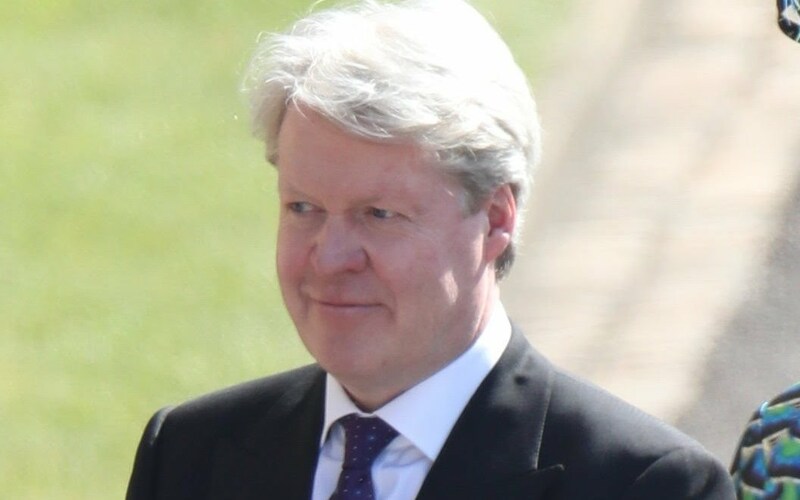 The decision will ensure neither endures the test faced by the Prince’s parents, where the then Lady Diana Spencer muddled her words to get Prince Charles’ middle names the wrong way around. Hymns will also honour the Prince’s mother, with Guide Me, O Thou Great Redeemer, otherwise known as Bread of Heaven, remembered both for being played at her funeral and as a Welsh rugby anthem sung regularly by Prince Harry. As the service continues, A gospel choir will perform Ben E King’s Stand By Me, later followed by Etta James' uplifting version of Amen/This Little Light of Mine - a joyous childhood favourite. Click here to read the full story. 09.00 - Members of the public who have been invited to watch the wedding day from the grounds of Windsor Castle begin to arrive. 09.30-11.00 - Wedding guests arrive at the Castle's famous Round Tower by coach and enter the chapel through the South Door and take their seats. 11.20 - Members of the royal family begin to arrive and enter via the Galilee Porch, some on foot and others by car. 11.40 - Harry and best man the Duke of Cambridge arrive at the chapel's west door, received by the Dean of Windsor. They will probably arrive on foot, walking past the thousands of spectators invited into the grounds of the castle. The moment will give Harry the chance to acknowledge the 200 representatives from charities he is associated with gathered in the Horseshoe Cloister at the bottom of the steps. 11.42 - Ms Markle's mother Doria Ragland arrives at the Galilee Porch and is received by the Dean of Windsor. 11.45 - The Prince of Wales arrives at the Galilee Porch. 11.52 - Following protocol, the Queen will be the last member of the royal family to arrive for the wedding service. 11.59 - Ms Markle arrives at the Chapel's West Steps by car, from her overnight accommodation at the Cliveden House Hotel in Taplow, Berkshire. Ms Markle will walk through the Nave on her own followed by her bridesmaids and pageboys who include Princess Charlotte and Prince George, before being accompanied by Charles down the aisle of the Quire. 13.00 - Service ends and the newlyweds emerge at the West Steps of the Chapel. They will be waved off on their carriage procession through Windsor by members of both families. The congregation will file out of the chapel to see the married couple leave before heading to St George's Hall for a lunchtime reception hosted by the Queen. 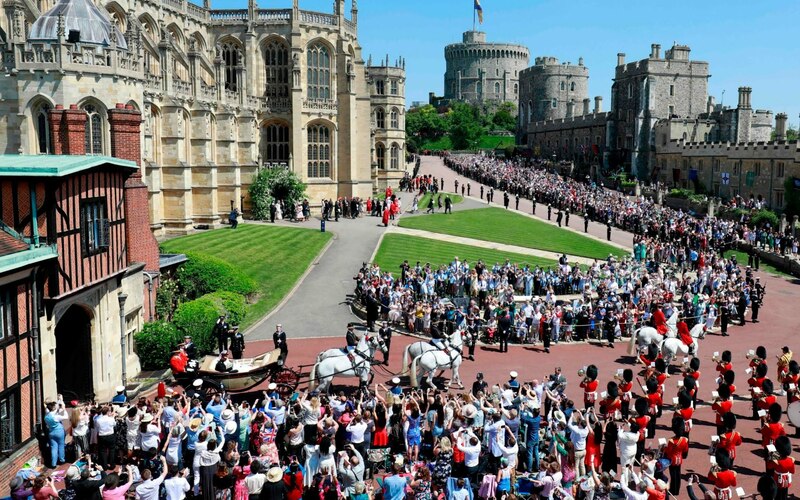 13.05 - The carriage procession through the streets of Windsor possibly begins around this time, taking 25 minutes. 19.00 - Bride and groom depart Windsor Castle for the evening reception at Frogmore House, hosted by the Prince of Wales. Good morning and welcome to our live coverage of the wedding of Prince Harry and Meghan Markle. Prince Harry's wedding day has arrived as he prepares to marry his American bride Meghan Markle in a glittering ceremony, watched around the world by millions. 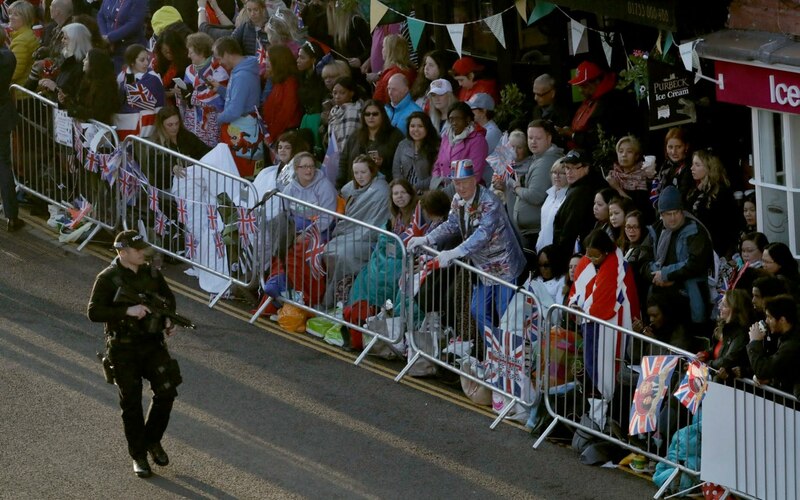 Tens of thousands of royal fans are expected to descend on the Berkshire town to catch a glimpse of the bride and groom, as police effectively create a ring of steel around the castle in a massive security operation. Some 250 members of the armed forces will take part in the pomp and ceremony of the celebrations, with regiments closely connected to former soldier Prince Harry lining the streets. Ms Markle will emerge from the hour long televised ceremony, which begins at noon, as an HRH and a member of the British royal family after saying her vows. Prince Harry is expected to be given a title, most likely a dukedom, by his grandmother the Queen in the morning, meaning Ms Markle would become a duchess on marriage. A relaxed-looking Prince Harry said he felt "great" as he greeted well-wishers in a surprise walkabout with best man the Duke of Cambridge outside Windsor Castle on Friday evening. Meanwhile 15 miles away, Ms Markle gave a radiant smile and said she was feeling "wonderful" as she arrived with her mother Doria Ragland at the luxury Cliveden House Hotel in Taplow, Berkshire. The Archbishop of Canterbury, who will marry Prince Harry and Ms Markle, has spoken of the strong bond the couple share. "You see in the way they respond to each other, caring for each other, which is something you see in many couples but not always. But it's very evident and that's wonderful." As the Order of Service was published on the morning of the wedding, it revealed Prince Harry will wear a ring - not a given for royal men - and Ms Markle will not promise to obey her husband in the vows. 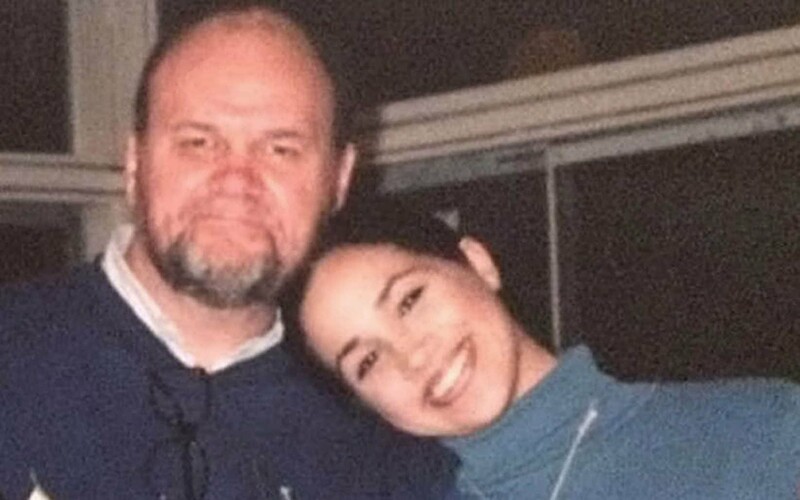 There will be sadness amid the joy for Ms Markle with her father missing her big day. Prince Harry too will be thinking of his late mother Diana, Princess of Wales, who died in car crash when he was 12. He has invited her three siblings, Earl Spencer, Lady Sarah McCorquodale and Lady Jane Fellowes, as a way of honouring her. Lady Jane is giving a reading. Ms Markle will leave her country hotel with her mother to be driven to Windsor Castle, giving the first glimpse of the bride in her wedding gown. Prince William, whose children Prince George and Princess Charlotte will be among the young helpers, will be supporting his younger brother Harry at the altar. 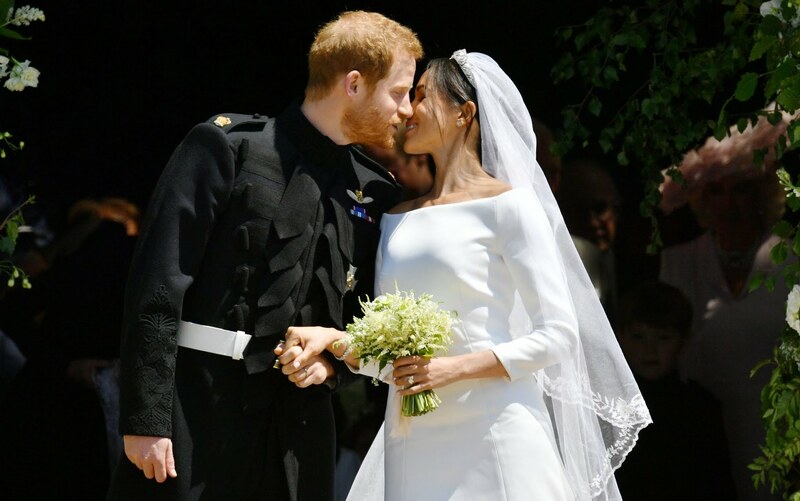 Ms Markle, who found fame played Rachel Zane in the US legal drama Suits, is the first mixed race person in modern history to marry a senior British royal. Prince Harry, 33, and 36-year-old Ms Markle became engaged following a whirlwind 16-month romance after going on a blind date in London. "It was this beautiful woman just sort of literally tripped and fell into my life, I fell into her life," he said when their engagement was announced last November. Ms Markle has been married before. She wed first husband film producer Trevor Engelson in 2011 but the pair divorced less than two years later. The last time a senior royal wanted to marry an American divorcee, it sparked a constitutional crisis and rocked the British monarchy to the core. King Edward VIII, Prince Harry's great-great-uncle, abdicated over his love for Mrs Wallis Simpson in 1936.